I may rename this blog All the Things I Refuse to Speak About. Last week (this one, too), it was politics. This week it is my mother’s cancer. The bird-of-the-week (I haven’t forgotten you, junco. You have kept me company these difficult days in Westerly at one of several of my mother’s feeders), is the Cooper’s Hawk. Christmastime, she sat in the neighbors’ tree eyeing the buffet outside my mother’s kitchen windows. Didn’t take long for the place to lose all its customers. I pointed her out one day to my mother who could only make out a dark spot in the leafless branches. Go someplace. That’s one of her phrases. When you ask her who her favorite child is. When my husband Dennis says he can’t wait to come talk to her about the Pats returning to the Superbowl next year. When anyone suggests she might benefit from a hearing aid. And maybe what she would have said to the Cooper’s Hawk once it got bold enough to sit on the hedges outside her front window where my brother installed another feeder that she can see from her recliner. We had drawn the shades so the morning sun didn’t hit her in the eyes and a wing flashed in the slit of light. It cast more shadow than a measly sparrow or one of her omnipresent house finches. When I lifted the shade, the feeder was deserted, but minutes later, the hawk landed, fixing its yellow eye on this side of the glass. “My god,” I said. “There it is.” An arm’s length away. Before my mother could see it, the bird vanished. But I witnessed it: the way the creature staked out her territory. The way she made it clear: trespass at your own risk. But trespass. What is there to say about a February where it is 60 degrees? Yes, when I head downhill each morning for my walk, the wind comes off the river and makes me zip my jacket all the way up, but by the time I’ve turned the corner onto one end of Beach Street or the next, I’ve peeled off mittens and bared my neck to the unseasonable weather. Fifty four years after I was born right down the street at the Westerly Hospital, I have discovered whole neighborhoods I didn’t know existed. Babcock Street, for example, the kind of eclectic neighborhood contractors have made rare. An American foursquare next door to a 1950’s ranch, across the street from a stone bungalow, a few feet from a modern monstrosity whose garage dwarfs the home’s narrow entrance. This is the kind of neighborhood, I think, that kids could ride bikes around. The kind of neighborhood that fills a schoolbus up and inspires block parties. Except I don’t really see kids riding bikes now or overcrowded busstops or block parties. Instead, for the last two mornings, it has been one man walking a big white shepherd mix and me wondering what it would be like to live in a house different from the one Dennis and I bought over twenty years ago because it reminded me so much of the house I grew up in. That house. This past week, my brother-in-law Bill sent me a memory stick with dozens of pictures of the farm which I promptly posted on Facebook. This morning, my cousin Rob shook his head. “Those farm pictures,” he said. Now that was a neighborhood. A neighborhood in which we escaped many things that could have killed us. In one photo, one our fourteen year old hired hands drives the David Brown tractor while my nephew Michael perches on the fender except he’s leaning down, looking over the treads and the hired hand, no doubt thrilled with his job, hurtles along over potholes and tire ruts. We climbed the 40 foot ladder outside the Big Jim silo on a dare. Jumped barn roof to barn roof, a pack of kids in flip flops. My brother, my cousin and I shared stories of corn trucks whose brakes gave out in busy intersections or pick-ups whose homemade sides rattled along the Interstate from the shifting weight of the thousand pound yearling bull in its bed, or the pliers pinched onto where other vehicles had gear shifts, or the rotting floorboards through which the highway’s lane lines flashed, or the passenger side doors that flew open when you turned a corner with your four year old passenger, unbuckled, in the seat. Bulls broke free of their stalls. Cows charged, foolish with the first warm day of the year. Hurricanes knocked silos over. Equipment churned and chugged and stalled and lurched with us at the helm or as passengers. Skittish heifers kicked off their machines and we felt the air whoosh by our cheekbones. We ice skated on ponds that weren’t necessarily frozen solid, smoked in the hayloft, rode standing up in the beds of trucks with no tailgates. Hawk, you would not have scared us. We were very young and, no doubt, exhausted by the work behind us and the work ahead. We had no idea what to fear. Hard to believe you, December, season of evergreens, of oak leaves shriveled, but tenacious. I’ve been walking without a coat. Haven’t begun the seasonal mitten matching quest. We’re doing our part in this charade. We’ve dug root vegetables, lit the woodstove. This week, Dennis bought an ice scraper at the grocery store, just in case, though this gesture seemed apologetic. A few days ago, I bought a birdfeeder that sticks to the window, a television for the cats, I thought, and we filled it with seeds that have gone untouched ever since. The birds are too busy bathing in the puddle at the end of my neighbor’s driveway, too full of sluggish insects and winter moths to eat seeds. It’s kind of like me still wearing the kinds of shoes I can wear without socks. Winter is so long — when it finally arrives — you get tired of certain things. Foods and fashions. Why not delay the inevitable boredom, the relentless sameness of the season? My father’s winter clothes: striped overalls over his usual work clothes (dark green Dickies, blue short sleeve shirt, crewneck sweatshirt);a hooded sweatshirt tied tight over a stocking cap; felt boots. Underneath the layers, he weighed under 140 pounds. He hated the cold. His birthday was the second, but he was an impossible man to buy for. Bags of Canada mints. Work gloves. Old Spice. And he wouldn’t feel much like celebrating. December, you were different then. Inside, my mother changed curtains and bedspreads. She made polenta and beef stew. Outside, cows’ coats thickened, hair sprouting over their polls like clownish toupees. The dogs moved into the hayloft at night. Some mornings, a lacework of ice in the waterbowls. Some of the barn’s broken windowpanes would be boarded up with old panelling, but as we walked past others with biscuits of hay for heifers stuck inside now, you blew at us your reminder: Yoohoo. I’m out here. You’ll miss me when January comes. Most afternoons, I sat inside at the kitchen table doing my homework, my stomach knotted as I awaited the sound of a car down the lane, a car that would deposit one high school boy or another to do the night milking. As often as they did show up, they didn’t, and eventually, my mother would stand peering out into the darkness and say, “I guess you’d better get out there.” The short days meant getting the cows up in the dark. No electricity, god forbid, in any barn, and the freestall, where we had to drive the cows away from the new silage and up to the parlor, seemed acres away from the light bulb that burned over the house’s back door. You wouldn’t have recognized me, December. I was too unprepared for you then, too convinced there was nothing to do against you. Inside my unlined rubber boots, my toes froze. My legs grew numb beneath my jeans and long johns. Each time I slid the barn door open to let in more milkers, my hands ached with cold, the door sticking in slushy ruts. Cows’ breath steamed windowpanes. So many of them, I dreaded counting groups. There were always so many more waiting to be tended to. Oh, December. What we wouldn’t have given for you then. A mild month for new calves. We could have kept our sleeves rolled up and not have soaked our cuffs that froze and burned the white skin at our wrists. The cows would have lingered in their pastures and that would have been a good walk. Moonlight, mist, the illusion of spring. But we were both very different then. I wish I could say you had been less ominous. I wish I could say I went uncomplainingly those nights, that I appreciated how dark the sky was there, how many stars shone over the silos. I wish I could say that I understood that those hours of working on that place and beside that man who, despite the exhaustion he must have felt, was much more liable to burst out into a Dean Martin song in the middle of milking as he was to complain about being cold and tired, would not last. But I’m a slow learner. The year concluded with you, December. This, of course, I understood, but I it didn’t make me understand how many other things were destined to end as well. One August, I was driving in Maine, heading north to raft on the Penobscot. In a culvert on the side of the road, stood a young moose. We could get out of the car and stare at him as he was so far below us, there was no danger, and I thought: I can’t wait to tell my father about this. My father had died the April before, however, and this moment made me understand all the things I’d have to store up to share with him one day if we do meet again. Maybe I had always seen the things he would want me to pay attention to: roadside flowers, birds, cloud patterns. Maybe, even if he had lived to be 200, as he promised me he would, I would still pause at a stream in hopes of spotting the beavers at work, or sit outside a snake hole with my daughter waiting for the creature to give us a glance, or stand at a meadow waiting for yellow finches to burst out of the grass. Or maybe, in his absence, these are the things I study because he can not. From this loss, in part, I have derived a great deal of poetry. But I am also a storyteller and, if my father was home waiting for me yesterday, I would have had a story for him. About how I had lunch with cousins, some of whom I’d never met. And, mostly, about how these cousins wanted to know where we all came from. That the story of his family mattered to them. I know he would have liked that. I was twenty-eight when my father died and not as devoted to my writing as I might have been, but I am older now, and this is what I’ve learned after several decades of writing and a couple of teaching: human beings love stories. We have, since the beginning of time, sat around the fire narrating the events of our days. We have etched them out on the walls of caves, have put them to music, have, ultimately, written them down. Stories connect us. So it should be no surprise, should it, that one woman might have heard a story about how her grandmother died and that, wanting her own, more substantiated version, she spent several years compiling the history of a family? What makes a story good, after all, is how we can’t predict where it will take us. For my own daughters who never knew my father, I try to bring him to life. Show them pictures, of course. Tell them what it was like to work beside him. For a few years, they even joined a 4-H club and learned to halterbreak heifers. “You know what my father would have said?” I say, sometimes, when they do something. Of course they don’t. 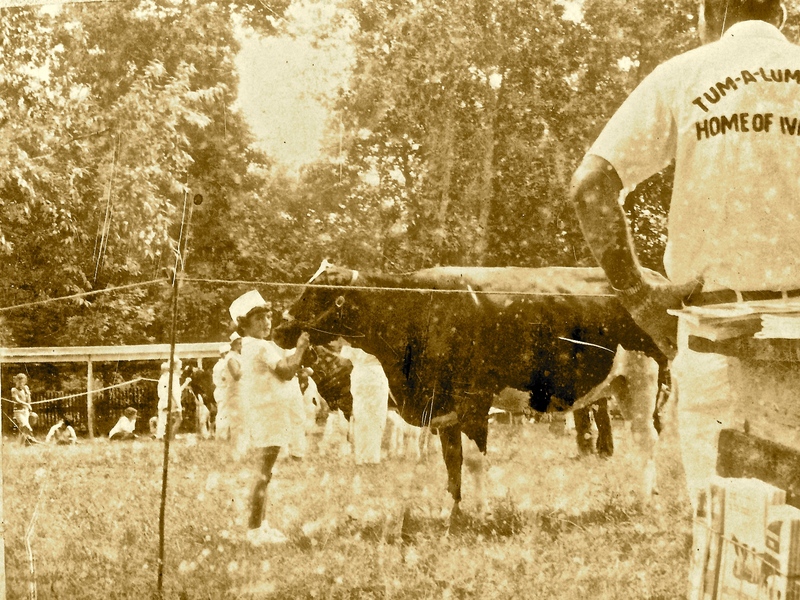 Maybe they have a few facts: he loved maple walnut ice cream; he owned one of the most famous bulls in the history of dairy farming; his voice was so hoarse, most people couldn’t understand him. These are what writers call character details. Small strokes, but no complexity. Still, they have more than what I have of my own grandparents. I know that my grandfather, Angelo, was such a good stonecutter/carver, he could cut more letters into granite than any other cutter at the quarry. My grandmother planted a white rose bush in front of the house. No food my father ate after she died tasted as good as when she made it. She made rugs out of rags. Always kept a pot of soup on the stove. When my father and his brother were done with the milk route, they climbed out of the wagon at the schoolhouse and the horses walked home alone, my grandmother and her sister waiting for them at the end of the lane to remove their harnesses. It is, essentially, a series of video clips that plays in my head when I think of them, but no real film. Yesterday, I want to tell my father, I added what I could add. I saw a picture of my grandmother, Giovanna, as a young woman, for example. I didn’t have to peer at a blurry group shot of her and her large family. I could study her face. Look right into her eyes. I could see that she was the tallest of her sisters, as tall as some of her brothers. But I couldn’t see my father in her. I learned that my great-grandfather made nails out of the iron mined in the Dolomites where they were from. Supported his wife and fourteen children. That the Zoldani, my father’s people, were noted for their nail-making. I saw a picture of my great-grandmother when she was very old, a woman used to the hard life of that place. And I saw a picture of my father as a very young boy (so young, in fact, he was wearing a dress. This, I would especially like to tell him.). He stood with his grandmother on a spot of grass that would one day be where he and his brother built a garage out of wood that washed ashore after the Hurricane of ‘38. He had a bowl cut, straight hair that surprised me. His dark eyes looked suspiciously at the photographer. Even then, I thought, a tough guy to please. My father as a toddler, reaching up to hold tight to his grandmother’s hand. You’d think it impossible until you remember: I am in the middle of a story and in a story, anything might happen.